Part I presented good reasons for pitching the idea of teleworking (working from home) when placing job candidates—from employer, employee, recruiter, national security and microeconomic and macroeconomic perspectives. The prospect of saving the U.S. more than $650 billion annually through expanded teleworking and the national security implications of teleworking were discussed as macro-economic incentives for recruiters to carefully consider recommending teleworking for the new employee being placed. Part II completes this discussion. Which Has the Bigger Tax Incentives: Commuting or Teleworking? Whether a candidate will be interested in a teleworking (a.k.a. “telecommuting”) option depends, of course, on whether, all things considered, it’s a better deal than commuting (the latter defined here as getting to work by any means other than walking). So, currently which benefits incentive is greater for employees—to commute or work at home? This can be very tricky to determine. For example, although home-based employment can afford the self-employed and employees various tax breaks, such as deductions of mortgage interest and utilities expenses, certain strict conditions may preclude eligibility of the voluntary teleworker. Ouch! That’s gotta hurt the wallet and any campaign to promote teleworking as smart, efficient, patriotic or otherwise somehow better than commuting. So, as it stands, if an employee wants to save some money and be spared the hassle of commuting, by working from home, and possibly somehow help America conserve energy, save the environment, maybe pay down its massive debt, or strengthen national security (through decreased dependency on foreign oil and resource-competition wars), the IRS seems to stand ready to make that a tad more difficult. Telework Savings: Really a “Good Thing”? save over 280 million barrels of oil (37% of Persian Gulf oil imports) valued at over $23 billion (based on $80/barrel). save consumers $15 billion at the pumps (based on $2.60/gallon). reduce greenhouse gases by 53 million tons—the equivalent of taking almost 10 million cars off the road for a year—that’s over 21% of the nation’s goal for GHG reduction by 2020.
reduce wear and tear on our highways by over 115 billion miles a year saving communities over a billion in highway maintenance. save almost 100,000 people from traffic-related injury or death. Accident-related costs would be reduced by almost $12 billion a year. increase national productivity by 5.5 million man-years or $235 billion worth of work. save businesses over a $200 billion in real estate, electricity, absenteeism, and turnover—together with the value of the increased productivity, that’s more than $10,000 per employee and more than double the average first-year cost per teleworker. Additional savings would result from reductions in other utilities, janitorial service, security, maintenance, paper goods, coffee and water service, leased parking spaces, ADA compliance, equipment, furniture, and office supplies. save enough in office electricity to power more than 900,000 homes for a year. enable employees to gain back the equivalent of 2-3 weeks’ worth of vacation time per year—time they’d have otherwise spent commuting. So, like penny-preoccupied victims of the Great Depression, modern recruiters are going to have to ask themselves whether saving, in general, and which (of these) specific savings will actually be good for everybody. Only then will they be in a position to knowledgeably weigh the question of how enthusiastically to embrace and recommend teleworking to employers, candidates and themselves. Recall that during the Great Depression, a fear-driven propensity to cut consumption triggered mass saving, rather than the kinds of investment that might have ended it earlier. Hence, although on the face of it, “saving” sounds good, it can cut in two senses and in two ways—one of which can really hurt. In this modern reckoning of the impact of telework savings, positive “economic externalities” such as cleaner air, improved health, conserved resources and world peace will have to be given their due weight. More direct, yet less easily calculated economic costs and benefits, e.g., actual impact on national debt, changes in net domestic revenue, income or job gains/losses, will, of course, be central to the process of deliberation. 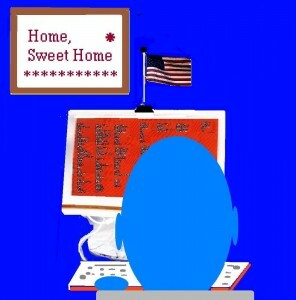 But, in the end, Yankee ingenuity being what it is, everything may turn out fine as U.S. companies, at home (as opposed to abroad), move toward an optimal mix of commuting and working at home (as opposed to at the office). For sure, Americans, being who they are, will (tele)work it out.